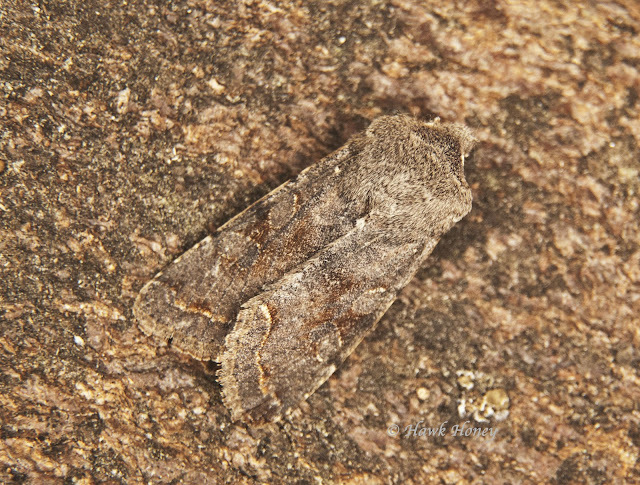 Well, I think it might be safe to say that spring is sweeping in with a woosh of wind and rising temperatures and moths! Yes, at last, after Friday's warming temperatures, despite the lashings of rain we had during the day, I thought the moth trap needed to go out. 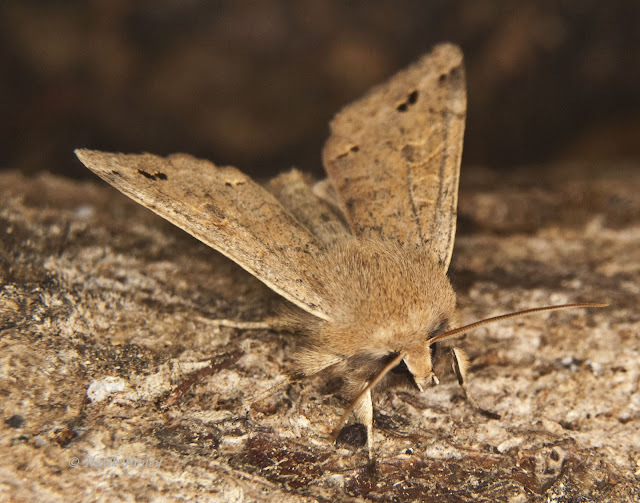 I'm glad I did, after last weeks 1 moth, a Common Quaker Orthosia cerasi, Friday's trapping saw 51 moths with 6 species coming to the trap! Oh joy!!!! And not just that, but after I put the trap out on Friday night I went straight out to my local wood with bat detector in hand. The temperature was holding around 7ºC and I was slightly confident of getting something, and something I got indeed, a pipistrelle! At first, in my excitement of hearing my first bat of the year, I thought it was and convinced myself that it was a Nathusius pipistrelle Pipistrellus nathusii. I say I convinced myself because even though the detector recorded the passing at 41kHz and the sound analyses program I have showed it the same, in checking the book on sound analyses, I misread the scale and thus told myself it was a Nathusius. However, a friend pointed out my error that a Nathusius echolocates around 38kHz and what I had was in fact a Common pipistrelle Pipistrellus pipistrellus. So lesson learnt, although I'm still happy with my first bat this year. So yes, here's the list of what I caught this weekend and some photos too. Very pleased am I let me tell you. So on with the photos. 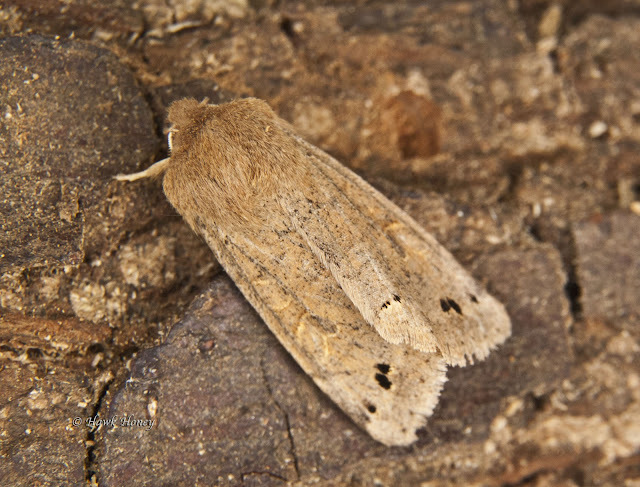 I'm not going to bother showing you the Common Quaker's as you saw that last time, no. First up will be a favourite of mine the Hebrew Character. Why is it a favourite? Because it's so easily identifiable when you open the trap and also it has such a lovely pattern to its wings. Judge for yourself. O gothica Hebrew Charcter, easily identifiable. O gothica face on showing the feathery antennae. 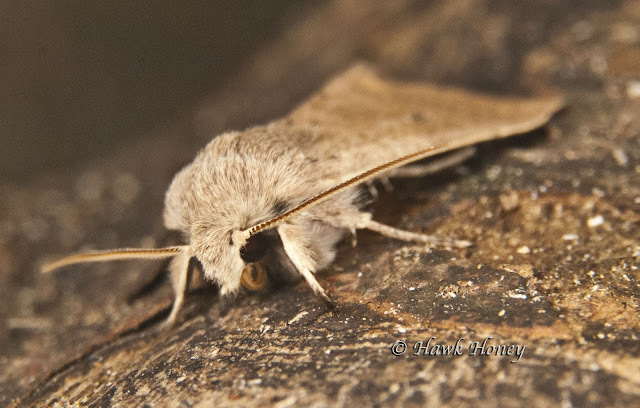 Then we have another moth from the same family, the Small Quaker. It's very much like the Common Quaker, just smaller. So I'm not going to show the patterning but I did manage to catch this photo which clearly shows the eyes and coiled up tongue of the moth which it unfurls to drink the nectar from the flowers it visits during the hours of darkness. Coiled tongue just below the eye. 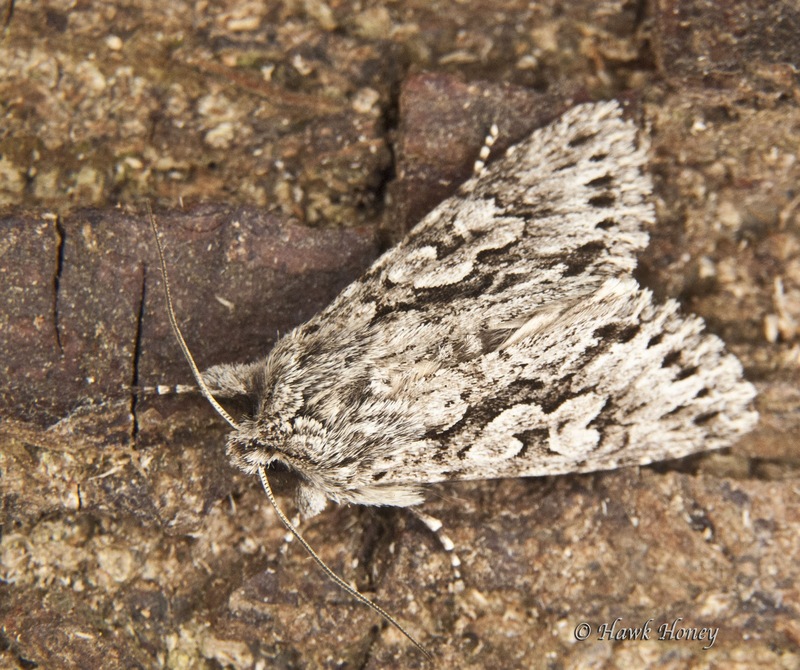 Another favourite moth of mine (you'll soon notice I have a lot of favourites) is the Early Grey. 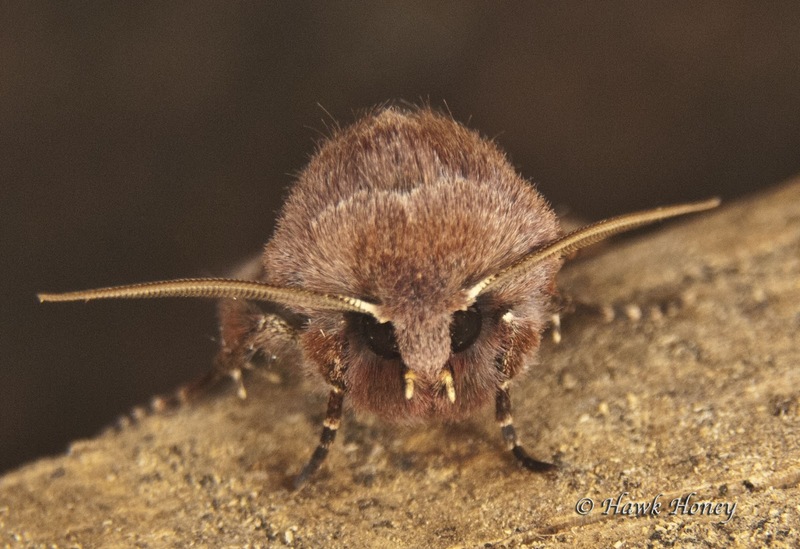 And the same moth getting revved up ready for take off. 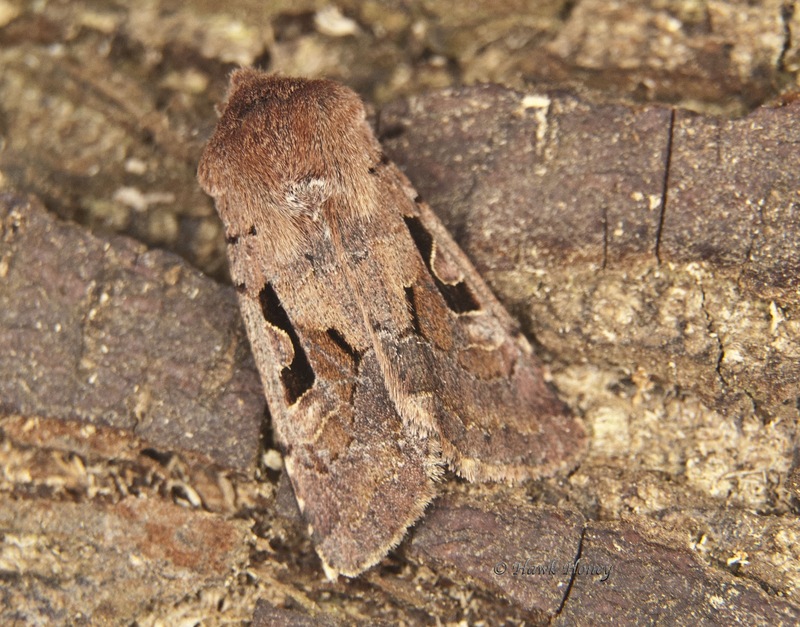 Last but not least on this weeks moths is always a difficult one to ID, but I think I got it right, is the Clouded Drab Orthosia incerta. O incerta. 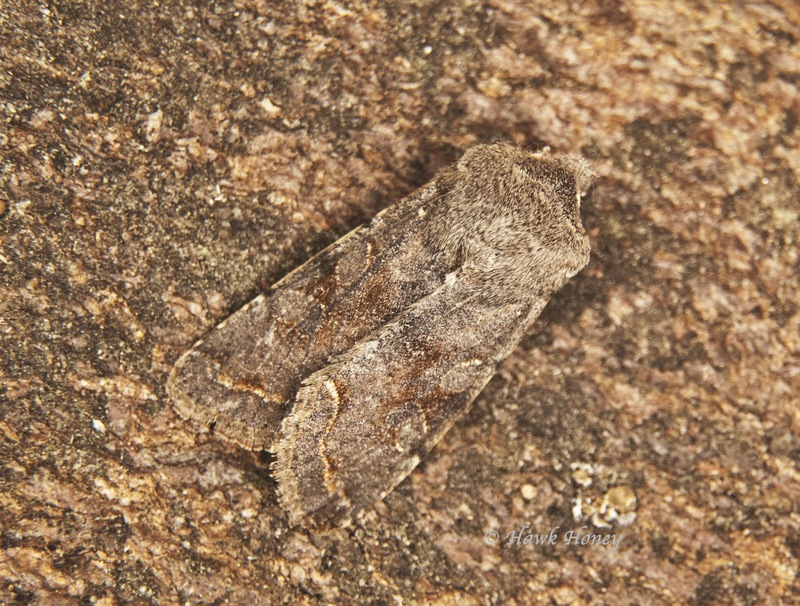 As you can see, the subtle markings are good for camouflage, but troublesome for ID'ing. Yes, also got my first bumbler on the list, a Early Bumblebee Bombus pratorum. Alas, I didn't get any photos of it as it was a little annoyed I caught it in a pot to ID and being the rough start to the year they've already had, I thought it best to let him on his merry little way as soon as I'd ID'd it. Now, if you or your kids are scared of bees, then fear not, this blog will give you the low down on what bees are likely or unlikely to sting you. Very interesting. Movement of the people, so Bob Marley sung. But the exodus I speak of is more of the amphibian type. The rising temperatures bring out the toads, frogs and newts as they feel the urge to head back to their place of birth to procreate and further their species onward. Bobbits Lane in Ipswich saw the migration getting into swing with helpers from Suffolk Amphibian and Reptile Group assisting 538 toads, 23 frogs and 1 smooth newt cross the road to get to their spawning ponds safely. Over the coming weeks this is set to continue and if you want to help out I'm sure they'll be glad you came along. It's not just there of course, garden ponds too have there part to play and this week saw this fellow arriving at my pond. Male Common toad Bufo bufo looking for a lady. How can any female resist such a good looking fellow??? That's it for now, I'm off to get ready for some bat hunting.